I'm a professional Java software developer since 2001.
after I noticed that none of the existing players fulfilled my needs. 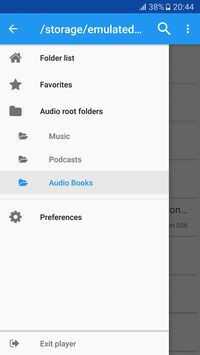 As the name of the app suggests, Music Folder player plays folders instead of albums. 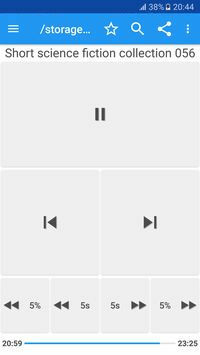 For each folder Music Folder Player remembers where you left. 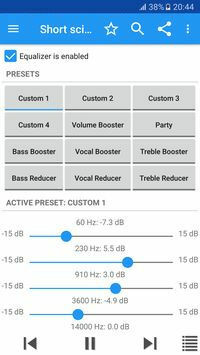 This is very useful if you listen to podcasts or audio books but sometimes want to hear music. You progress will never get lost. 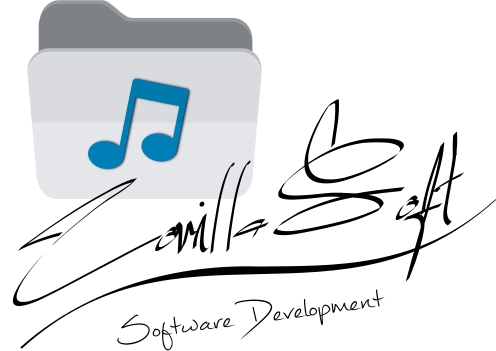 Music Folder Player provides a screen with big buttons which is meant to be used while driving or during sport activities. 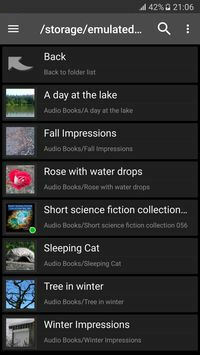 Play and manage you favorite tracks in a virtual folder. This section answers the frequently asked questions. Please have a look here before you send me a mail. Question: Why do I still see advertisements? I paid for the full version. When you buy the full version, the free version is not uninstalled automatically. Most likely you still start the free version. Please uninstall the free version or update the app icon on the home screen. Question: What's the difference between the free version and the full version? The full version doesn't show ads and it comes with homescreen widgets. Besides that, there is no difference. Question: Why does the app sometimes resume the playback at the beginning and not at the previous position? Unfortunately that's a relatively common problem which is related to the firmware of the device. It's important to know that the decoding and playback is done by the Android OS. 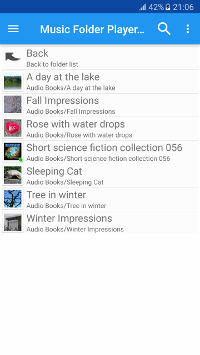 The player is just a front-end for the Android media framework and usually does not use internal audio decoders. It's a known problem that some devices can't seek properly in long tracks. The player provides the right position to Android, but some devices are not able to seek to the given position in long tracks. 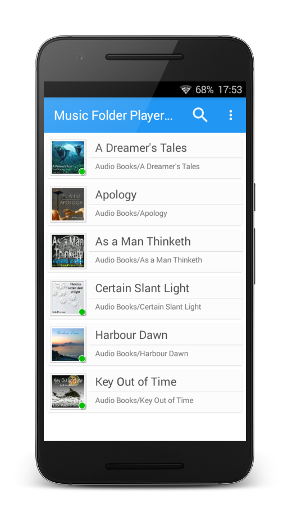 In case you are using audio files in the formats MP3 or Ogg Vorbis, I can provide an alternative. Please try enabling the internal audio decoders in the preferences section 'General'. Other users reported that the internal audio decoders are not affected by this issue. Please keep in mind that the internal audio decoders are currently in an early test phase. You may see other issues with that. Question: Why does the app stop after a short time? The app doesn't stop without a reason. Usually such issues are caused by Android. Some manufacturers use a very aggressive power management in order to save as much battery power as possible. Such devices stop apps which are running in background in order to save as much battery power as possible. In most cases it is possible to define exceptions for apps you want to be running in background in the battery or power management settings of the device. If that's not possible, it may help to configure a moderate battery management for the system. Sometimes other tools like the popular "cleaner apps" kill other apps in order to free memory. Here you can usually also define exceptions. Question: How do I repeat a song? Once you play a track, long-press on it in the list. There should be a popup menu where you can select 'Repeat'. Another possibility is to use the 'Quick Actions' menu. You can reach that with a long tap on the Play/Pause button. There you find some additional useful shortcuts. Question: How can I download new songs? That's not possible with this app. This player only plays what is already on your device. Downloading commercial music from the internet is illegal in most countries. Question: Does this app play WMA files? 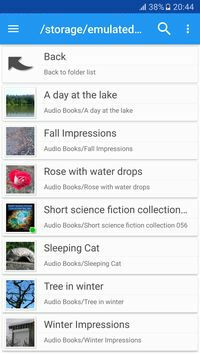 In general, WMA is supported by the player, but it depends on your device which formats are working because the player does not have internal decoders. 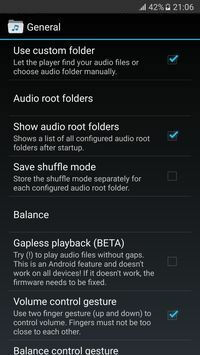 The audio decoding is completely done by the Android firmware. 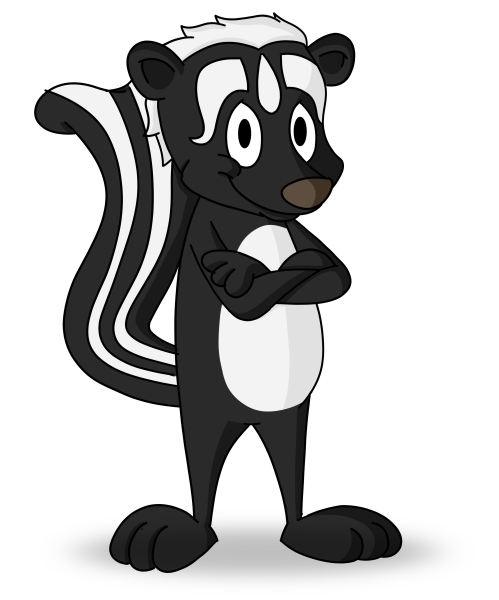 Some manufacturers don't support the WMA format because the licenses are very expensive. For the same reason I can't add support for WMA if it is not already supported by the firmware of your device. The license costs would ruin me. 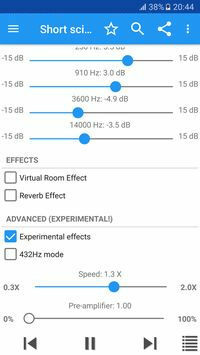 Question: Can you please add skipping tracks with volume buttons? I would love to implement this. 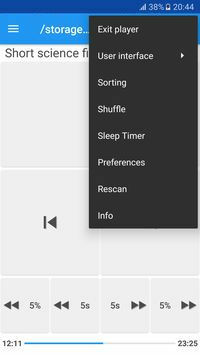 Unfortunately Android does not forward volume button events when the screen is locked. There is no clean way to implement this. Question: Can you please add feature XYZ? Most likely I could. Currently I develop this player in my spare time. The list of features I want to implement is already very long. Therefore I need to prioritize. If you want to see a feature which was already requested by many users, I will most likely implement it. 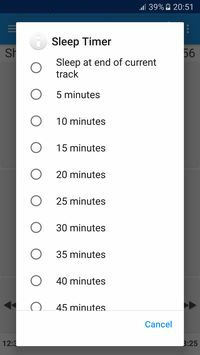 If your feature request is very specific, the change that I will ever have enough resources to implement this is relatively low. By the way, I will not implement a feature just because someone gave a one star rating at Google Play. For me this feels like blackmail. The chances are much higher if you send me an e-mail. Question: Can you explain the permissions of the player? Fortunately the Android operating system doesn't allow Apps access to all data and functions of your device. For some features the app needs permissions you grant by installing the app. I understand that some permissions are not clear if you don't know all features of the player. The following list shows each permission and for what feature each permission is required. 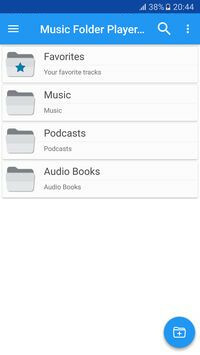 Storage: This is necessary for renaming and deleting audio files. Also the playback progress is saved within each folder. Network communication: The free version is supported by advertisements which need to be fetched from a server. The full version which does not sow advertisements does not request this permission. Phone calls: This permission is required in order to pause playback during calls. Of course the player does not read who you are calling or who is calling you. System tools: The player can be configured to keep the backlight on. This permission is required to access the backlight. 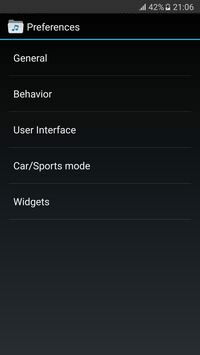 Bluetooth: The player needs to be able to detect that a Bluetooth headset (or any other A2DP device) connected in order to switch to the car/sports mode if that's configured by the user. Unfortunately Google missed to provide some of the permissions in a more fine grained way. For example the player can theoretically read incoming or outgoing call numbers because it is the same permission which allows to detect that a call starts. Of course the player is not interested in any phone number. The full version requires this permission as well, but since it does not have internet access permission, it would not have the possibility to send this data anywhere. I assure you that the player does not collect any personal data. If you need further information, please contact me via email. I will answer all your questions as good as I can. Question: I already have the full version, but I would like to support you with a donation. How can I donate? Some people asked me about a paypal address for donations. Of course donations are welcome if you want to support the development of the player. Please keep in mind that this is not meant to be an alternative payment method if you can't buy the full version from Google Play! That's because I don't have possibility to provide updates and update notifications in a comfortable way. In other words, please first buy the full version onb Google Play. If you think the price is too low, fell free to donate an additional amount of your choice. Donations should be independent from feature requests. I can't guarantee that I will implement specific features even if it comes with a donation. Please always try the free version before you purchase the full version! Free Version. Please always try this first! Full version with homescreen widgets and without ads. Please don't use the Google Play review section for this! Have a look at the FAQ section. Common questions are already answered there.